How long have you worked with Arteco and what compelled you to join the team? 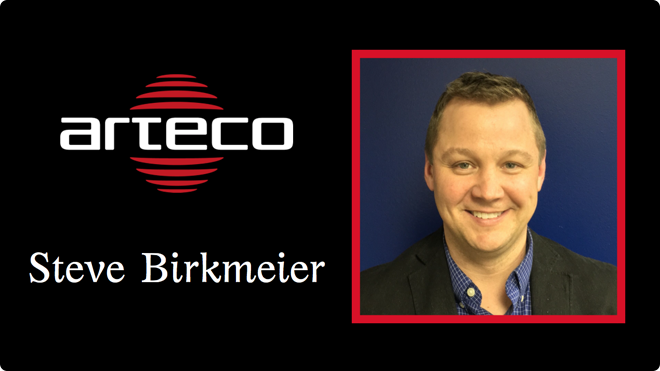 I started with Arteco in May of 2005 when we opened the U.S. division of the company. I have always been drawn to the challenge of building something from the start up and I was and still am very fascinated by the technology and the opportunity to help customers solve security and operational challenges. Arteco has given me a very unique experience to grow and we have seen incredible change in the industry; it has been an extremely educational ride. What are some of your day-to-day tasks in your role with Arteco? My kids ask me all the time what I do for a living and I usually tell them I am a problem solver. Management is primarily problem-solving, which really keeps you on your toes. One of the great parts about working with Arteco all these years is that every day is a new challenge. I manage the sales team, I work with customers, I work with the marketing team, I sit in on new product development meetings — it’s a constantly evolving role. I’m also one of the main spokespeople for the company, so I get to do interviews like this! What is your favorite part about working for Arteco? It’s tough to pick just one. The first is that every person in the company has an impact on the success of the business and I know that my decisions and opinion matter. This is powerful and rewarding and I think Arteco is unique in this element. The second would be the global aspect of the company. Not only has this taken me to some really cool places for business travel, but there are also days where before lunch I have spoken to people on video calls from multiple continents all over the world from my office in St. Louis. This never ceases to amaze me. A few of Arteco’s core principles include facilitating open integrations and ensuring effective customer service and training. Why do you think these are critical? How have you seen the security industry change during your years with Arteco and where do you think it’s headed? It’s quite interesting: when I first started with the company, the concept of VMS didn’t even exist. It was entirely analog cameras and DVRs and the software was just a utilitarian piece of the pie (I know ours certainly looked utilitarian at the time!). Back in those days, we saw the market leaders as huge “siloed” companies, where they sold everything an integrator would need all the way down to the cable connectors. Then IP and VMS emerged and there was a huge wave of innovation with many new companies and products; the old companies either died out or had to change their approach. Now, 10 years after this wave hit, we are seeing some of those companies that were new and innovative starting to act like the big companies of the analog days. Innovation is being stifled and growth is coming from acquisitions of smaller companies and other products. In many ways, this “silo mentality” is happening all over again. I think the future of security is going to be about extending the investment in camera infrastructure into other facets of business. In retail, for example, this is already happening with products that tie video analytics, such as people counting, heat-mapping and dwell time, into point-of-sale data to give retailers real-time conversion rates. We are also seeing this in many industries that have track and trace components in their operations or compliance standards that must be met. What do you like to do in your free time outside of work? I love spending time with my wife and two boys. We like to be outdoors; kayaking, hiking and sailing are some of our favorites. We also like to hang out at home and just relax on the weekends. I am a food guy and I love to cook for friends and family — if I can have six hours on the weekend to smoke some meat, I am a happy person. What can attendees at GSX expect to see from Arteco at booth #2341? We’re looking forward to displaying our expertise in intelligent, data-driven security solutions that allow enterprises to maximize safety and enhance business operations. We’re excited to demonstrate our Video Event Management Software (VEMS) options for a range of vertical markets, such as retail and cannabis, the award-winning Arteco Face Recognition and the ability for users to seamlessly integrate Arteco’s solutions with a wide variety of third-party devices. We’re also thrilled to be exhibiting with our valued partner Hanwha Techwin; our long-standing collaboration enables comprehensive management of the entire range of Wisenet devices and embedded analytics applications within Arteco NEXT VEMS. See it for yourself: schedule a meeting for GSX now with our team. We hope to see you at the show!